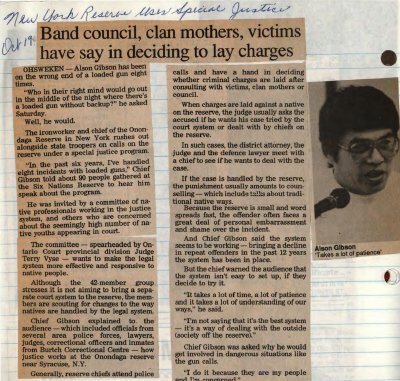 "New York reserve uses special justice - band council, clan mothers, victims have say in deciding to lay charges"
OHSWEKEN - Alson Gibson has been on the wrong end of a loaded gun eight times. "Who in their right mind would go out in the middle of the night where there's a loaded gun without backup?" he asked Saturday. The ironworker and chief of the Onondaga Reserve in New York rushes out alongside state troopers on calls on the reserve under a special justice program. "In the past six years, I've handled eight incidents with loaded guns," Chief Gibson told about 90 people gathered at the Six Nations Reserve to hear him speak about the program. He was invited by a committee of native professionals working in the justice system and others who are concerned about the high number of native youths appearing in court. The committee - spearheaded by Ontario Court provincial division Judge Terry Vyse - wants to make the legal system more effective and responsive to native people. Although the 42 member group stresses it is not aiming to bring a separate court system to the reserve, the members are scouting for changes to the way natives are handled by the legal system. Chief Gibson explained to the audience - which included officials from several area police forces, lawyers, judges, correctional officers and inmates from Burtch Correctional Centre - how justice works at the Onondaga reserve near Syracuse, N.Y.
Generally, reserve chiefs attend police calls and have a hand in deciding whether criminal charges are laid after consulting with victims, clan mothers or council. When charges are laid against a native on the reserve, the judge usually asks the accused if he wants his case tried by the court system or dealt with by chiefs on the reserve. In such cases, the district attorney, the judge and the defence lawyer meet with a chief to see if he wants to deal with the case. If the case is handled by the reserve, the punishment usually amounts to counselling - which include talks about traditional native ways. Because the reserve is small and word spreads fast, the offender often faces a great deal of personal embarrassment and shame over the incident. And Chief Gibson said the system seems to be working bringing a decline in repeat offenders in the past 12 years the system has been in place. But the chief warned the audience that the system isn't easy to set up, if they decide to try it. "It takes a lot of time, a lot of patience and it takes a lot of understanding of our ways," he said. "I'm not saying that it's the best system - it's a way of dealing with the outside (society off the reserve). Chief Gibson was asked why he would get involved in dangerous situations like the gun calls. "I do it because they are my people and I'm concerned." Gibson, Chief Alson ; Vyse, Terry.